Emirates celebrated another milestone on Wednesday with the delivery of the airline’s 100th Boeing 777-300ER, the world’s largest, long-range twin engine commercial aircraft. The Boeing 777-300ER forms the backbone of the Emirates fleet with the aircraft type currently operating to 77 destinations on the airline’s global network. Delivery of Emirates’ first Boeing 777-300ER took place in March 2005 and with a further 52 aircraft on order, the airline is the world’s largest operator of this aircraft type - in fact one in every five 777-300ERs flying today is in Emirates’ livery. It takes 47 days to build a 777-300ER and each aircraft is made of three million parts. If you took all of the wiring contained within Emirates’ 100 777-300ERs and placed it end-to-end it would stretch from Dubai to New York and back again. Sir Tim Clark, President of Emirates Airline said, “The Boeing 777-300ER is one of the most remarkable aircraft ever built, and its combination of efficiency, range and payload is second to none. Our customers are equally excited by the aircraft and its on-board product, and to date over 108 million passengers have flown on an Emirates Boeing 777-300ER. “We have 204 more Boeing 777s on order, which supports over 400,000 jobs in the United States of America, including those from various suppliers such as General Electric which provides the GE90 engines that power all of our 777-300ERs,” added Sir Tim. The range of the Boeing 777-300ER is 14,490 kilometres, and Emirates’ longest flight with this aircraft currently operates between Dubai and Houston which is a total distance of 13,120 kilometres. 16th June 2003: Emirates announced an operating lease order for 26 Boeing 777-300ERs at the 2003 Paris Air Show, worth $5.6 billion. 20th July 2004: Emirates ordered 4 Boeing 777-300ERs with 9 options at the 2004 Farnborough Air Show, worth $2.96 billion. 26th March 2005: Emirates receives its first Boeing 777-300ER. 20th November 2005: At the Dubai 2005 – 9th International Aerospace Exhibition, Emirates announced an order for 24 Boeing 777-300ERs. In all, Emirates ordered 42 Boeing 777s in a deal worth $9.7 billion, the largest Boeing 777 order then in history. 11th November 2007: At the 2007 Dubai Air Show, Emirates ordered 12 Boeing 777-300ERs, worth $3.2 billion. In 2009, Emirates became the world’s largest operator of the Boeing 777 with the delivery of its 78th B777. 19th July 2010: Emirates ordered another 30 Boeing 777-300ERs at the 2010 Farnborough Air Show, worth $9.1 billion. 13th November 2011: At the 2011 Dubai Air Show, a firm order was placed for 50 Boeing 777-300ERs with options for another 20. The deal was worth $18 billion, the largest commercial order by value in Boeing’s history. 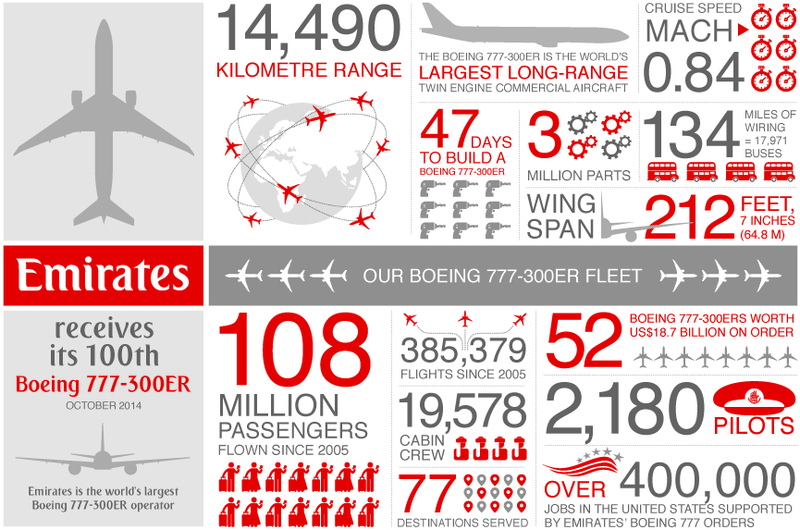 3rd March 2012: Emirates received the 1000th Boeing 777 which was a 777-300ER variant. 17th November 2013: In the 2013 Dubai Air Show , Emirates made aviation history with a record-breaking order of 150 Boeing 777X aircraft. 29th July 2014: Boeing delivers its 500th 777-300ER to Emirates. Emirates is the only airline in the world to operate all 6 variants of the 777 family. 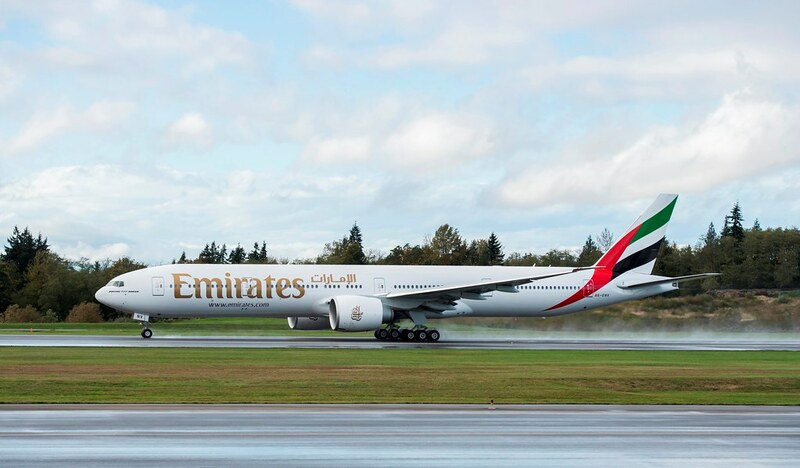 29th October 2014: Emirates receives its 100th Boeing 777-300ER. Emirates operates one out of every five Boeing 777-300ERs in the world.